Those who knew Paul G. Allen at Washington State University were taken with both shock and sadness when they learned of his death last week. 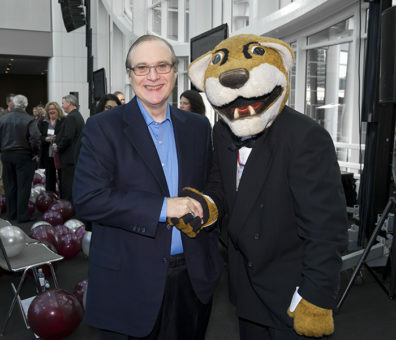 Paul Allen celebrates the launch of The Campaign for Washington State University: Because the World Needs Big Ideas with WSU’s mascot “Butch” in Seattle on December 2, 2010. Allen, 65, was a noted technologist, philanthropist, community builder, conservationist, musician and supporter of the arts who attended WSU from 1971‑74. He died in Seattle from complications of non‑Hodgkin’s lymphoma on October 15th. Allen was presented the Regents Distinguished Alumnus Award in 1999. The highest honor WSU bestows upon its alumni, the Regents Distinguished Alumnus Award is given to those who demonstrate extraordinary accomplishment and vision that contributes to the betterment of our world. Allen generously supported a range of WSU programs that reflected his broad interests—from technology to global health to the arts. A member of Phi Kappa Theta fraternity, he replaced the chapter house with a state-of-the-art building, and wired all of WSU’s sororities and fraternities on the Pullman campus for the digital age. In 1998, the Paul G. Allen Virtual Education Foundation, created a process for developing online courses that revolutionized how WSU would deliver instruction. Allen also invested generously in agricultural research and the Museum of Art, among other things at WSU over the years. In 2010, he made a leadership gift to help create the Paul G. Allen School for Global Animal Health at WSU’s College of Veterinary Medicine. The Allen School is unique among other global health programs because it focuses on the health of animals as a way to improve the health of people and the environment. Guy Palmer, Regents Professor of Pathology and Infectious Diseases and senior director of Global Health, worked closely with Allen and his Foundation to bring his vision to Washington State University. The video below was produced in 2011 to honor Paul Allen’s generous contributions across Washington State University.